Last week I had two visitors: my mom and her exuberant friend Susan. I have met many foreigners in my time here in Grenoble, but very few who got as excited about the mere idea of being in France as these two miscreants. "We're in France!" they would squeal. And then insist that we should drink wine. Just because they were in France. 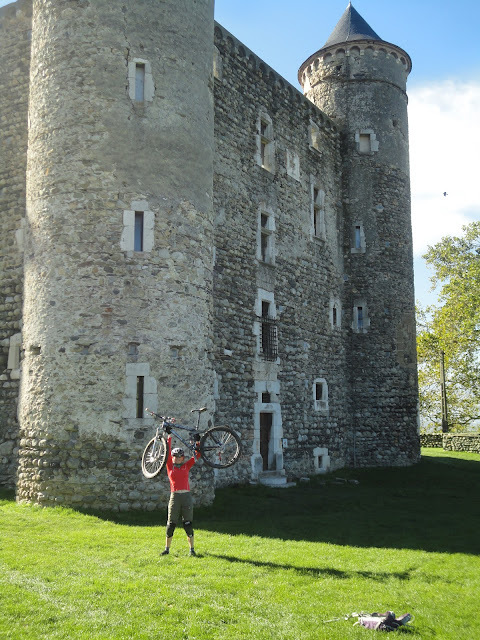 Needless to say, this lead to a week of culinary and cultural indulgences the likes of which a poor bike dirtbag like me hasn't seen yet in France. Who knew something other than biking was fun? Two happy travelers share French (!) wine thirty. We ate a lot of good food, so much that I don't dare to present photos of it all in fear that the reader might actually faint of jealousy. A few Grenoblois culinary secrets, however, should come out. 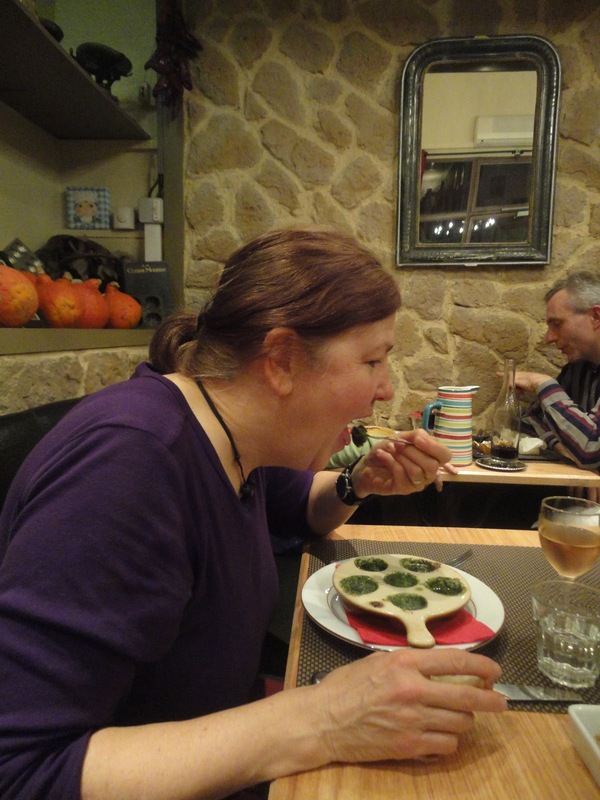 Mom tries the escargot. Best. Snails. Ever. Susan samples a surprisingly hot butternut squash soup. Can you say filet mignon? World's lightest lemon meringue pie. The next evening we went to Bombay, an Indian restaurant with good reviews on Tripadvisor. When we found the restaurant, we say that there were a bunch of people milling around outside, and immediately assumed that there was a line. Oh no! Mom peaked inside, however, and there were no customers there. Odd. Finally on of the waiters walked by, and Mom waved at him. He looked startled, and finally came to the realization that the door the restaurant had been locked. That's why we have no customers! he must have thought. So we got to enjoy more food. Mom and Susan try beer inside of wine. Most. Filling. Curry. Ever. I am embarrassed to say that I could not finish it. 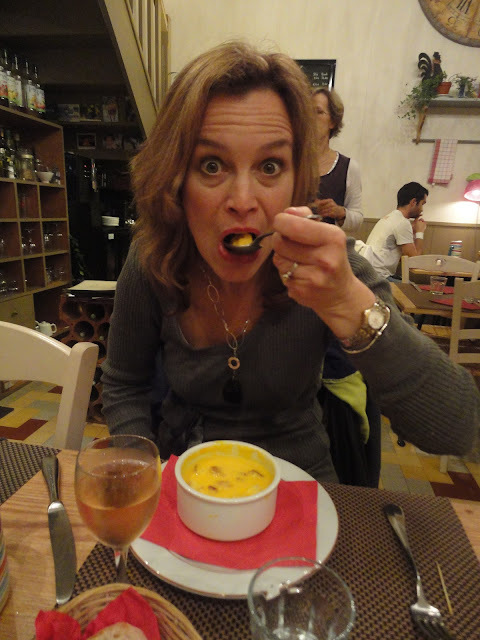 Mom and Susan ARE IN FRANCE! 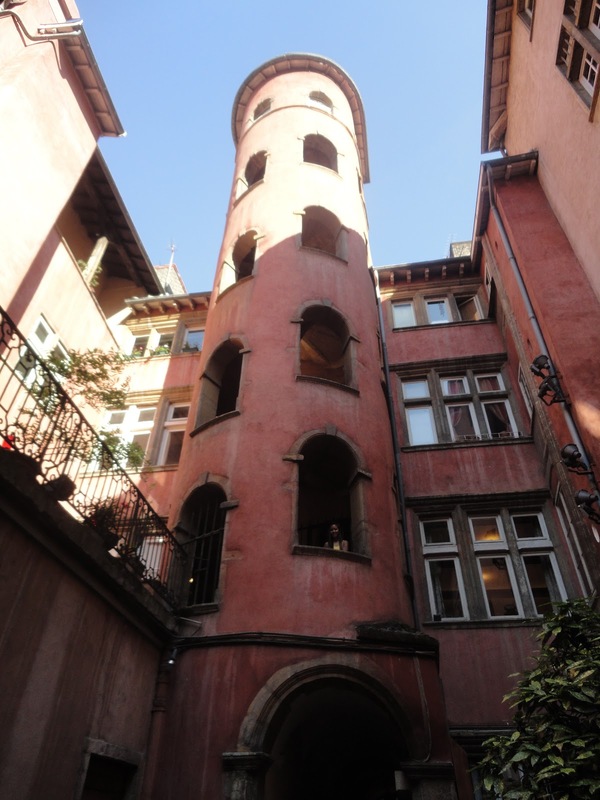 On Saturday, we went into Lyon, a city rather like Grenoble only bigger and without the mountains I'm always raving about. 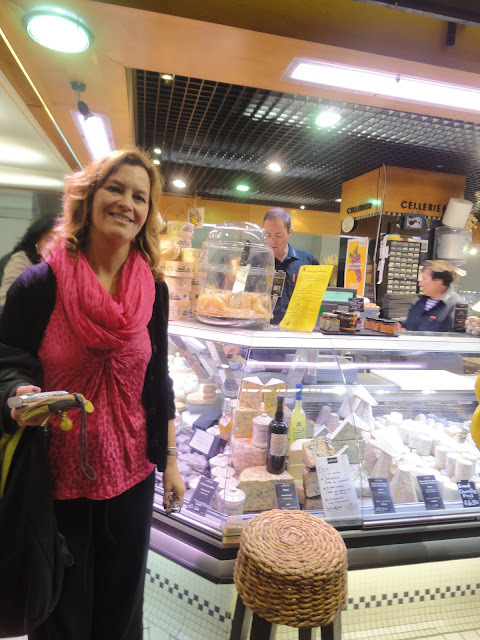 We visited the incredible Halles de Lyon, where they have every sort of food you can imagine. It's sort of overwhelming; there are so many good things to eat that it's hard to pick one! I had a spinach and chevre tart while Susan and mom just took pictures and walked around the football field-sized market. Susan at one of many cheese places. Later we wandered over to the old city to check of the famous traboules, and up to the Basilica of Notre-Dame de Fourvière on the hill. The river Rhône flowing through Lyon. Cool view up through the interior of one of the big traboules. On Sunday, me and Mom sent Susan home and climbed the previously documented Le Mouchrotte, enjoying gray but clear weather - we saw Mt. Blanc in the distance! I sent Mom home on Tuesday, leaving me feeling slightly lonely after a week of such great company. Luckily, the mountains will always be my friends. It snowed in Belledonne on Monday night! As much as I've enjoyed the bike season, I'm ready for the ski season. Drool picture of Belledonne. Ski season, come to me! Me and my friend David revisited my favorite castle - and this time went closer to check it out. Château de Bon Repos, with Grand Veymont featured prominently in the right half of the picture. More drool pictures of snow covered mountains. We finished off the ride with some cool, twisty singletrack through the leaf-strewn forest. I have no pictures, because I was having too much fun.